ACCU-DART for Sage 300 ERP is available as a complete package, or as an individual module, and can be easily customized to your specific needs. ACCU-DART is the ideal solution for warehouse management. 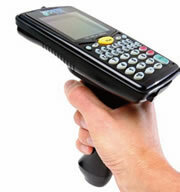 The 7000 RF Terminal (by WORTH data) is compatible with ACCU-DART's systems. It is a powerful, low cost, easy-to-use radio frequency interactive terminal which communicates with any computer by serial port. It comes with or without handle. Base station can be purchased separately.